The balcony is a place where you and your guests can enjoy cool atmosphere over a good conversation. Therefore, this is one area in your home that needs to be presentable. Learn how to spice up this area with a little creativity. Real plants are always better than fake ones when outside, they’re beautiful and give off a sweet scent. They make the place look real and appealing. Include bright flowered colors and play with the colors to create a perfect blend. 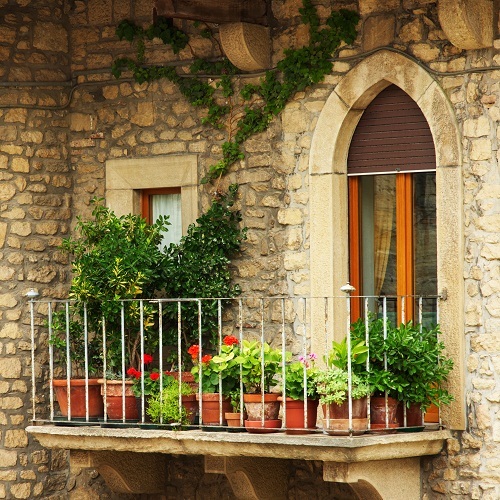 Even small balconies can use this trick to give a wider impression. When you choose to include artificial flowers, make sure you choose the ones that at least look real. A good choice in furniture for your outside haven could make you want to spend more time out there. Be sure it’s comfortable and appealing to the eye and this doesn’t mean it needs to be new. In fact, antique chairs look more chic on a balcony and will surely impress your visitors. There are things that are definitely a no go for the balcony. Remember these tips when decorating. Do not clutter. Make sure there is walking space throughout the balcony. Don’t use the balcony as storage. This is not where you want to pile up old shoes or unused items. Do not keep worn out flowers. Change flower settings occasionally to maintain the cool ambiance. Do not allow for pets on your balcony. This can get messy, if it is a puppy they may chew on some of your furniture. Do not use slippery floors on your balcony. It is very risky. Instead, lay down a nice area rug to maintain stability if your guests are walking around. This entry was posted in Gardening Tips, Home Design Ideas and tagged Balcony Garden, Gardening, Home Decoration. Bookmark the permalink.